Make your workouts more convenient and quiet. You might be surprised at just how much sweat can fly from your body as you exert yourself through heavy pedaling. No one wants to be forced to mop up large amounts of sweat after every workout. Also, no one wants to slip and fall because they didn’t realize how slick the floor had become. One of the best ways to make your cleanup easier is to invest in a bike trainer mat. This is simply a padded mat that goes underneath a bike trainer. Its main purpose is to catch the copious amounts of sweat that will likely be flying from your body once you get up to a really good speed. 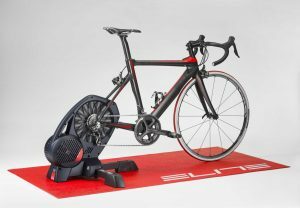 In addition, a good bike trainer mat should help by providing traction to keep you and your equipment in place, and should also protect your floor from any dirt and scratches. 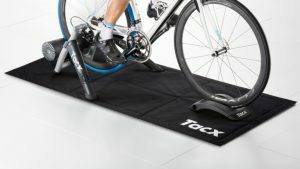 We will be reviewing the top 5 bike trainer mats so that you can more easily decide which one is right for you. This is a long, narrow, and rough-textured mat. It is significantly longer than it is wide, being 78 inches long and 36 inches wide. However, this is not a bad thing, especially for longer models or for actual bikes operated on a stand. At three feet wide, it is still more than sufficient for catching sweat. The roughened texture of this mat is intriguing since it probably wouldn’t be made this way without reason. The reason is the fact that this mat does not absorb sweat like many other mats. Its surface is more or less waterproof, and the sweat is able to collect in the small depressions of the mat’s rough surface. This does make the mat easy to clean, as you just run a mop over it real quick. However, it could be problematic for excessive sweaters. As more and more sweat pools up, it could become a safety hazard or at least run off the mat and soil your floor. The Wahoo is the largest mat on our list overall, so be prepared for a little bit of straining when you move it around. The Wahoo mat is made from a type of PVC, which is more durable and long-lasting than rubber. The mat is 6mm thick and has a beveled edge so that it provides a smooth transition from the floor below. The entire surface is made to be non-skid so that you won’t slip and fall due to the sweat collecting on the mat. This rough texture also does a good job of holding your equipment firmly in place. As a final added plus, the mat is meant to absorb sound, which is great for anyone who may be working or sleeping beneath you. The product does lose a few points for the fact that it is cumbersome and difficult to transport. It weighs about seven and a half pounds, which is a little heavy for this kind of thing. It isn’t particularly easy to roll up either. It’s a little bulky, but a pretty good product overall. It takes longer to unroll and set up than most of our other choices, so it does lose a few points in the portability department. However, I would probably recommend this one for in-home use just because it is the largest. This is another long mat with a width of about three feet. At 64 inches long and 36.75 inches wide, it is a little shorter than the Wahoo. 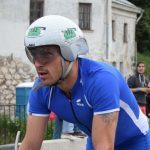 The relatively short length is a significant drawback because you will usually have very little room in front of the bike or behind it. To be fair, this should also make the mat easier to roll up and transport, but none of that will matter if it does an inferior job of catching sweat and grime. That’s not to say that this mat cannot do its job. It is up to the task, hence why it is included in the top five. However, this mat just doesn’t stack up very well when compared to other models in its class. This mat is 4mm thick and weighs about 8 pounds. This is another negative because they somehow managed to make a smaller, thinner mat that weighs half a pound more than the Wahoo. The texture of the mat looks nice but doesn’t do a particularly good job of providing traction. It almost seems as if the texture was designed for looks rather than for effectiveness. On the plus side, this mat does roll up very easily and does a good job of resisting the urge to retain its curve. I might recommend this one if it weren’t so heavy. I might also recommend this one if it were just a little bit cheaper. As it is, I can see no reason to buy this product. I recommend leaving this one on the shelf. 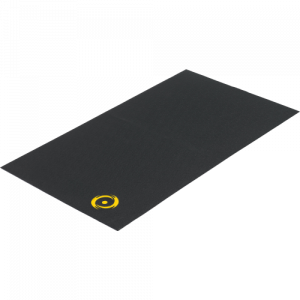 The Elite training mat gets a few points right away for being the best-looking choice on our list. The bright red color combines with the suave and swishy logo emblazoned down its length to create a visually appealing mat. However, looks can be very deceiving, and we have no intention of allowing ourselves to be deceived! So, upon closer inspection and a little bit of use, we find that this mat is pretty good. When you stand on it, you can feel that it is made from a densely packed foam that has very little “give.” It almost feels like one of those small foam surfboards in that it is a very firm surface while still being soft. The surface is roughened but not excessively, much like the texture of Naugahyde. At 70×35, this mat is longer than most of our choices, but not as long as the Wahoo. In width, it lags behind our other competitors, but not by much. 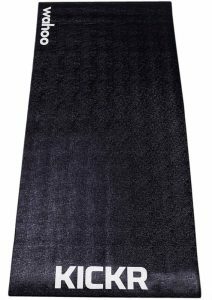 This mat is easy to clean and does not soak up sweat like many other mats of this type. Instead, the surface is meant to be wiped off after use. However, the surface is not as rough as the Wahoo which makes me concerned about slips and falls. In addition, the brightly colored surface of the mat causes any scuffs or marks to show through much more clearly than they would on a plain black mat. If you make use of pedal cleats, I will avoid this one because the cleats are likely to scuff up the surface and make the mat look very bad. It isn’t exactly easy to remove all those scuff marks either. At 7 pounds, the Elite is pretty light, in spite of its 5mm thickness, and rolls up easily into a surprisingly small tube. The Elite does lose a few points for being the most expensive mat on our list, being significantly higher in price than our other competitors. This mat stands out as the cheapest choice on our list, although it’s only slightly cheaper than two of the others. Still, this might make a difference for those on a budget. This is a very spacious mat, measuring 72 inches in length and 36 inches in width. This puts it in the same general range as most of our other choices, but with a little bit more wiggle room. If you like having a mat that covers a nice wide area, this is a good choice. The texture provides a very good grip on top, being deeply grooved in a way that is both attractive to look at and very functional. I will say that the gripping abilities of this mat are slightly inferior when compared to some of the others, but the difference is pretty small. Another good thing about this product is the fact that it is specifically made to resist odors so that it won’t end up reeking of old sweat like gym equipment often does. This mat is not designed to shed water or to absorb it fully. The designers took a middle-ground approach and made this mat able to absorb a small amount of moisture on top. However, the water-resistant lower layers keep the moisture from seeping through and defeating the entire purpose of this mat. The mat is half an inch thick and has beveled edges for good transitions. As a budget option, I can’t find any real flaws with this mat. It has a good “squishy” feel under your feet without feeling like a waterbed. My only real concern with this product is that it seems to be made of simple rubber, which isn’t as long-lived as some of our other candidates. This seems like a mat that could break down somewhat over time, but that’s mostly speculation on my part. This is definitely the smallest mat on our list. At only 68 inches long and 29 inches wide, it might seem unsuited for a larger bike or a particularly sweaty person. However, this is easily the fanciest mat on our list, which might offset its obvious deficiency in size. Most of these bike mats are made of a single material, but this one is a composite mat consisting of several layers that work together for several different purposes. At 5mm, the mat is definitely thick enough to do the job without being thick enough to cause problems. Let’s talk about the weight. This thing only weighs about two and a half pounds, making it our lightest mat by a long shot. Because of this, it is harder to get this mat to lay flat. It just doesn’t have the weight of a big rubber slab to hold it down. However, in terms of portability, this mat offers a lot. The upper layers of the mat are very absorbent and are intended to absorb large amounts of sweat. Of course, the bottom layers are moisture-proof to prevent this from going too far and wetting your floor. Rather than rolling into a tube, this mat just folds up and goes in a bag for easy transport. 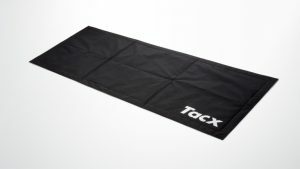 In general, I would recommend this product for those who have a need for a very light and portable mat. Although I prefer a heavier mat, it isn’t always possible to lug a big heavy roll of rubber around with you. My only real complaint with this product is that it is kind of ugly, and looks like a tarp at first glance. Another slight downfall is the fact that this mat will need to be cleaned more often than most others. This is due to a large amount of sweat that it is designed to absorb. The traction and grip of this mat are also not the best, in part due to its low weight and also due to its relatively smooth surface. The following is intended to be a general guide to the various features that you might see in a bike mat. Most bike mats are made from one of three materials: rubber, PVC, or foam. 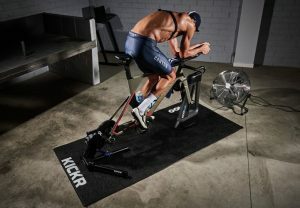 Some are also made of fabric like the TacX, but those are much less common. The differences between these materials are easy to guess. 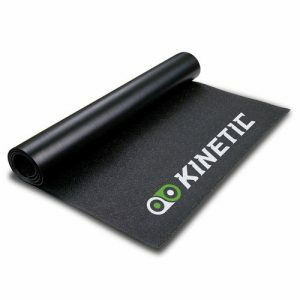 A rubber mat will usually be heavier, while a foam mat will tend to be lighter. PVC is a lot like rubber in this case, except that it is harder and a little more durable. Softer materials like foam will usually develop an imprint from the base of your bike trainer rubbing against its surface. Think about how much abuse you expect your mat to take. If you wear cleats, take that into account. If you have pets or kids, take that into account. As a general rule, thicker mats can take a lot more abuse before they fail. However, you don’t really need a whole lot of padding for this purpose. There is no one right size for everyone because bike trainers come in a variety of sizes. You should measure yours before you start looking for a mat. Not only should your mat be large enough to accommodate your bike, but it should also have extra room around the bike. This helps to ensure that the mat does its job and keeps all that flying sweat off your floor. One of the purposes of a bike mat is to provide traction so that you and your bike don’t move around. As the surface gets wet from dripping human sweat, this gripping power may be reduced if the mat does not have sufficiently good tread. Much like a good tire or a shoe, your mat should have good deep tread that holds everything in place. It probably surprises you to find out that there is so much to a simple bike mat. It just goes to show that anything can be improved with a little bit of science. There is every reason to believe that these things will only get better and more advanced in the future. We hope that this short guide has been helpful and that your chosen product serves you well.